10 Saskatchewan riders made the trip out to Big White (Kelowna) B.C. 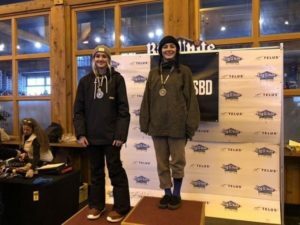 to compete at the BC Snowboard Provincial Series events. The 2 day slopestyle saw competitors from across western Canada and a couple from the United States. This was their first opportunity to hit a “Big” jump line this season. Our riders competed hard and had 5 great days of progression. Although everyone had a great event congratulations to Tate Schiele for making finals on the first day with a top 5 qualification result and a trip best SK rider score of 85.25. Great job to Angelina McCaffrey who placed second in the female U18 category, both Saturday and Sunday and to Koy Ernst who finished 3rd on Sunday in male U13. Great job everyone and on to the next one!